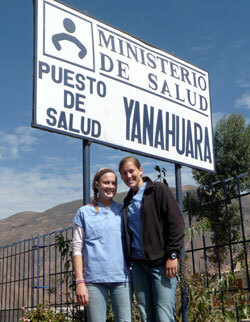 When the frightened father carried his newborn baby into the medical clinic in the remote region of Peru, he never imagined that the welfare of his first child would depend upon two volunteers who are college-aged sisters from Indianapolis. He also never expected that his 10-hour walk carrying his two-day-old daughter from his home in the mountains would eventually lead him to name the baby after one of the sisters. While that encounter became a life-altering moment for the father, it also was a defining experience for Kelly and Megan Gardner, members of St. Thomas Aquinas Parish in Indianapolis and recent graduates of nearby Bishop Chatard High School. From early June to mid-July, the sisters spent six weeks in Ollantaytambo, a breathtakingly beautiful community surrounded by mountains in the South American country of Peru. 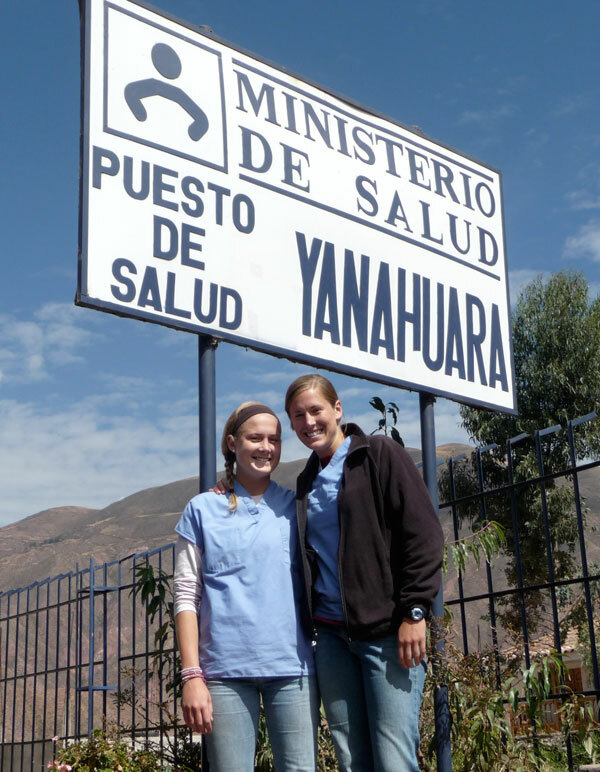 With 21-year-old Kelly planning to become a physician’s assistant and 20-year-old Megan studying to become a nurse, they wanted the experience of providing hope, help and health care to people in need in a foreign country. One of those experiences came as they witnessed the birth of a child at an outpost clinic. Yet even that remarkable moment wouldn’t compare to what happened the next day when the young father walked into the clinic looking fearful and frazzled. After a nurse fed the baby, the sisters helped her clean the infant. When the nurse left to get the vaccinations, the baby started crying. Megan picked up the tiny girl and tried to calm her as the father watched. When the nurse returned, she asked the father for the money to pay for the vaccinations. He said he didn’t have any money. The nurse told him she couldn’t give the baby the vaccinations unless he could pay. Kelly and Megan watched the interaction in disbelief. They didn’t have any money with them, having left their cash at the home of their host family miles away. The father looked despondent, as if it had just struck him that he had to walk back up the mountain, carrying his infant daughter to their home. The staff at the clinic didn’t seem concerned about the man’s plight. Kelly and Megan decided to intervene, following an approach that Kelly learned in the summer of 2009 when she was a medical volunteer helping HIV/AIDS patients in Africa. So when the father left the clinic with the baby, Kelly and Megan went with them. The sisters hailed a passing vehicle, telling the driver about the father’s plight and asking for a ride to Ollantaytambo, the community where their host family lived. The driver agreed. Once there, Kelly raced to the host family’s house to get money to buy food for the father and his wife, and milk for the baby. She also found and paid the driver of a van who agreed to transport the man and his daughter up the mountain to their home. All the while, Megan held and comforted the baby while trying to converse with the father in the basic Spanish she knows. During that conversation, Megan asked the father some questions that reflect her irrepressible spirit. A short while later, Kelly came back to meet Megan and the father, returning with the woman who is the mother of their host family. Megan told both of them about the baby’s name. They both laughed. The mother of their host family then wrote down the spelling of “Megan” on a card for the father. Through it all, the father kept thanking the two sisters. Before he climbed in the van with his daughter, photographs were taken and another round of smiles was shared. That prayer revealed another impact of the sisters’ six-week stay in Peru—an even greater reliance on God in their lives. That faith-sharing was part of the experience in Peru that helped to deepen an already close bond between Kelly and Megan. They grew up sharing a bedroom, wearing each other’s clothes and playing on the same sports teams at St. Thomas and Bishop Chatard schools. Megan says that one of the toughest times of her life was when Kelly left their family’s Indianapolis home to attend Davidson College in North Carolina. After hearing about Kelly’s adventures in Africa last year, Megan wanted the opportunity to share a similar experience with Kelly this summer. So Kelly planned the trip. The feeling was mutual for Megan. Now, their bond includes wanting to make a difference in the lives of others. “When I left Africa, I felt this calling to come back and serve underprivileged people,” Kelly says. “They have virtually nothing, and they’re very happy and faith-filled. We have a lot in America, and we don’t always appreciate what we have.